The well respected roots of Stranahan, Stranahan & Cline go deep. The name Stranahan has been synonymous with the legal profession in Mercer County since the 1860’s. James A. Stranahan was born in Philadelphia in 1839, but raised in the Mercer area. He was a Civil War veteran who graduated from Westminster College in 1864 and began practicing law in the borough of Mercer. Mr. Stranahan did not attend law school, but read the law, as was the custom in that day. He was a Pennsylvania State Representative and the Assistant Attorney General for the Commonwealth of Pennsylvania. James A. Stranahan continued to practice law until his death in 1924. James A. Stranahan, Jr., the nephew of James A. Stranahan, was born in 1880, and was a noted civil and criminal trial attorney in Mercer County for many years. He also read the law and studied under practicing local attorneys, and attended the University of Pennsylvania School of Law. In 1912, he began practicing law in Mercer County. 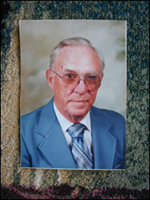 Mr. Stranahan, Jr. was a member of the Mercer County Bar Association, and practiced law in Mercer County until his death in 1964. James A. Stranahan III, was born in 1919, and began to practice law with his father and brother, John Q. Stranahan, in 1948, after returning from active duty in the United States Marine Corps during World War II. He was severely wounded on the Island of Saipan during the War. As an Infantry Officer he survived two invasions and received the Navy Cross for heroism, the highest Marine Corps award next to the Medal of Honor. He graduated from the University of Pittsburgh School of Law in 1948. James A. Stranahan III, was a noted trial attorney who also specialized in Real Estate and Wills and Estate matters. He was known to try twenty cases a year, and was always actively pursuing his clients interests at the courthouse. Attorney Stranahan’s practice was predominantly insurance defense work, but he also acted as the solicitor for several area schools, and represented several banks in the area. He practiced criminal defense work and actually tried a murder case. He retired from the law practice in 1992, and resided in Mercer until his death in 2003. 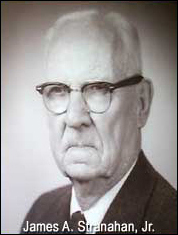 John Q. Stranahan began to practice law in 1947 after graduating from Case Western Reserve School of Law. During the 1950’s, John Stranahan was the District Attorney for Mercer County. In 1966, he was elected as a Common Pleas Judge for Mercer County. During his tenure as judge, he became President Judge and later acted as the County’s Senior Judge assisting other counties with their caseloads. Judge Stranahan was a very well respected member of the Pennsylvania judicial community, and was asked to take part in several Superior Court appeals cases, and even wrote appellate opinions. Judge Stranahan died on September 2, 2000. Another member of the firm, Thomas T. Frampton, joined the firm in 1974 after graduating from the University of Pittsburgh School of Law. Mr. Frampton was elected as Common Pleas Judge in Mercer County in 1985 and served one ten year term, before returning to private practice in the Pittsburgh area. Currently James A. Stranahan IV is a fourth generation attorney practicing in Mercer County. He began practicing law in 1979 with his father, after graduating from the Thomas M. Cooley School of Law in Lansing, Michigan. Early in his legal career, he was an accomplished criminal defense lawyer, who tried several jury cases. James, IV currently practices civil law concentrating on civil litigation and jury trials, medical malpractice, personal injury, domestic law, real estate, and estate work. The firm of Stranahan, Stranahan & Cline currently has two partners, James A. Stranahan IV, and Jack W. Cline, who have been practicing together for over 25 years. Jack Cline joined the law firm in 1984, after graduating from the University of Pittsburgh School of Law. Ever since joining the firm, Mr. Cline has been a well renowned criminal defense attorney in western Pennsylvania. He has tried numerous criminal jury trials, as well as many civil jury trials. Attorney Cline is also well known for his administrative law work assisting businesses and other groups in dealing with the Pennsylvania Liquor Control Board. In 1992 he became a partner with James, IV upon the retirement of James, III. In 1999, Paul J. Powers became an associate member of Stranahan, Stranahan & Cline. Mr. Powers graduated from the University of Pittsburgh School of Law. Attorney Powers handled several criminal and civil trials for the firm, assisting Attorneys Stranahan and Cline. After five years of practice in Pennsylvania, Attorney Powers and his family relocated to Virginia Beach, Virginia. In 2009, Gregory O. Metrick, of Butler, PA, joined the firm. He handles criminal defense, DUI, traffic, domestic and gas lease issues, along with general civil litigation.